A comprehensive list of popular email questions with answers. How do I? What is? Can I? Want to understand how something works then you might find your answer here. How do I know if I’m using POP3 or IMAP4? I want to change from POP to IMAP can I? What is a Do not Reply Email Address? How do I get notified when I have a new email ? My Emails seem to be missing on my Tablet/smart phone? I’m Setting Up Email for a Small Business can I use a free Gmail account? How to Copy Text from web page into an email? What is Phishing and How do I know if it is a Scam? Should I use an ISP (internet service provider) email account? Can I recall Email That I’ve sent? Can I access my email using outlook on my computer and my web browser when travelling? What is Email Address re-use or recycling? I’ve forgotten My Email Password What should I do? Can I send Email to a mobile phone? On your email client go to your email account and look at the properties. If you see an IMAP tab then the account is using IMAP otherwise it is using POP3. If you have been using email for a long time then you may find that you are still using pop3 to access your email. Using POP3 makes it very difficult to access email with multiple email clients like a mobile phone and a PC and so almost all new email accounts use IMAP or http. If you still have POP3 accounts then I would consider moving them over to IMAP4 as soon as possible and it is easy to do. See Change from POP3 To IMap4. If you reply to this email address you may receive an message undeliverable message or you may not depending on how it is implemented, but you won’t receive a reply as no one is monitoring the mailbox. Email notifications are common on tablets and smart phones. However on desktop machines they are not so common. Most email clients on smart phones and tablets will only synchronise recent emails (usually around 30 days). This is to preserve space as tablets/phones have limited storage. If you want to see your older emails you need to locate and change this setting. Gmail does provide email for small business but it is different from the standard free email in that it uses your own domain name and it isn’t free. The Small business email tutorial will give you a better overview of your options. What are MX records and do I need to change them? MX records are used to tell Email servers the address of an email server for a particular domain name. Alternatively copy into a notepad file which removes the formatting and then copy from notepad into the email. Many emails that look suspicious are real but I never follow links in emails or download items from email links unless I’m 100% sure that they are genuine. Most ISPs provide free email accounts as part of the connection Package. The main problem with using these types of email account is that they are tied to the ISP. This means that if you change ISP you will need to change your email address. It is for this reason that I don’t use recommend that you use them, and prefer instead Gmail,Yahoo or Hotmail accounts. No. Email that has been sent cannot be recalled. However Gmail does provide an undo send feature that really should be called delay send as this is what it does. With the feature enabled when you hit send the message isn’t sent immediately but a delay of up to 30 seconds is inserted. If you are quick enough then you can stop the email being sent. If you cancel an email address on an email provider e.g an ISP when moving providers then that old email address may be re -allocated to a new user on the old email provider at a later date. There are two alternatives available. You can try to find out the password which can be surprisingly easily to do See Finding and recovering a Lost password. If that fails you will need to reset it. See Resetting a Yahoo password for an example of this process. Yes in theory but no in practice. The email address mailbox name (appears before the @) is case sensitive but it is not enforced. How Many Email Addresses Should I have? I would recommend you have two email addresses, or at least access to two email addresses. The reason is that most password recovery options use a second email address to send the recovery links to. Without access to a second email address password recovery can be difficult. What are catch-All Email Addresses? What are Lifetime Email addresses? What are Email Addresses and How do they Relate to Mailboxes? What are Disposable Email Addresses? What is the difference between a Mailbox and Inbox? What is a Universal Inbox? What are Out of Office Replies/Replies? What are Email Signatures and Why are they Used? What are Message Rules or Filters? How do I recover emails that I’ve deleted? How Do I Permanently Delete Email ? What is BCC and When Should I Use it? What is email address verification?- How Does it Work? How Do I Create Strong Passwords that are Easy to Remember? What is the best way of Sending Large Attachments? What is Spam or UBE (unsolicited Bulk Email) ? How Do I know if My email has been Received or Read? A catch all address is a special case of email forwarding. With a catch all email address then all email sent to anyone@yourdomain.com will be forwarded to a single mailbox. When retrieving email you only need to connect to mailbox1 to retrieve email sent to any of the addresses. Email forwarding is a technique for transferring an email from one address to another. For example an email addressed originally to steve@flasedomain.com can be sent to steve@gooddomain.com by this technique. The technique is the same as used with normal mail when moving house. You arrange with the post office to send all mail addressed to your old address to your new one. Email forwarding can be either manual (done by the person receiving them email) or automatic (the email server forwards the email without any user intervention). These are email address that you keep (permanently). The best way of getting a lifetime email address it is necessary to own your own domain name. Many universities allow you to keep your university email address by using the technique of automatic mail forwarding. Email addresses are often confused with Mailboxes. However an Email addresses is not the same as a Mailbox. The address is simply a label that is usually attached to a mailbox. All email addresses have the form name@domain-name. Email addresses are linked to mailboxes or they can also be forwarded to a mailbox. The mailbox stores the email. If Spam is a big problem for you then consider using Disposable email addresses. These are addresses that you can throw away at any time. They’re used mainly in public postings, chat programs, and web forms.Disposable email accounts are valid addresses. Mail sent to them is forwarded to another email account (the real account). 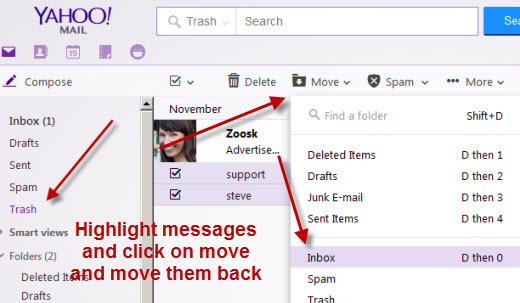 Yahoo email supports disposable email accounts. What is the difference between a Mailbox and Inbox ? A mailbox is a collection of folders for storing email messages. It consists of several folders like sent mail, inbox, drafts, Outbox etc. New folders can normally be added to the mailbox for organising email. The Inbox is just one of the folders contained in the mailbox and is the default location for all received email. Most current email clients (including Outlook Express are capable of receiving email from multiple email accounts. The email is placed in the same inbox (universal inbox) regardless of which email account received it. Usually you will need to find a way of marking the emails to different addresses e.g. using colours. On the email server of your email provider e.g. Yahoo. HTML email does however have some drawbacks: – It is normally much larger than plain text and can contain viruses and tracking code. It is also not universally supported. Having said that most people today send and receive HTML email. It is usually a email client option. address etc. With HTML signatures you can even add a location map. Here are the setup instructions for windows live mail, Yahoo email and Gmail. Here is a Microsoft tutorial covering email signatures and outlook 2010. These are rules that are applied to incoming messages usually for organisational purposes. Examples are a rule to move all messages from sender A to folder A or to generate an auto reply to all incoming messages. The sophistication of the rules depends on the email client in question. Rules/filters can be applied to the message on the email server or the email client. Features like out of office response/reply are applied at the server as it is always connected to the Internet. Rules applied at the client work only for POP3 mailboxes. See Outlook express message rules for examples and configuration. 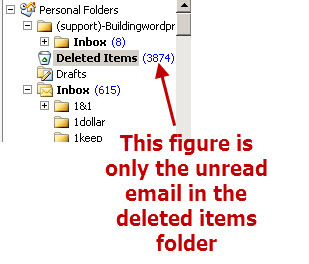 Can I recover emails that I’ve deleted? provided the email is still in the deleted items folder you can move it back to it’s original location. 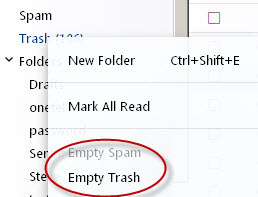 On Yahoo mail ou can delete all messages in the trash can by using the empty trash option > Right click on trash can and select from the menu. The Bcc line (blind carbon copy) is used to send email to someone without other recipients of the email being aware that it was sent to those recipients. It is effectively a way of hiding email recipients from each other and helps maintain privacy. Its main use is when sending email to mailing lists ( email groups). If you send an email to recipients using the to and or the cc line the recipients of the email can clearly see who the email was sent to. If one of the recipients was a mailing list then all recipients can clearly see the recipients on the mailing list. If the mailing list is confidential (list of clients) then it isn’t anymore. If anyone does a reply to all the reply is sent to everyone on both the original to and cc line. Putting the mailing list on the Bcc line solves both of these problems. I would urge anyone who send email to mailing lists or mailing groups to use the Bcc line. However it is especially important for very large mailing lists and confidential lists. Also depending on the law in your country/state you may be in breach of the data protection act by divulging someone’s email address to a third party. The first step is to start to create a new message. All subsequent messages will display the Bcc line until you disable it by turning the all headers off. See Using to,cc and bcc by example. What is Email Address Verification and how does it Work ? Email Address Verification is the process of establishing the validity of an address. It is used by mailing list owners to prune out old invalid email addresses. Email valuation tools work by sending an email to the address an monitoring for errors. If you are having difficulty reading your email you should remember that it is possible to change the size of the text. 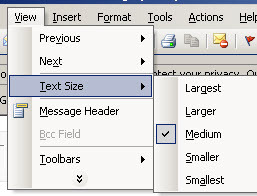 If you are using the web mail interface (web browser) then you need to change the text size on your browser. For Firefox Go to View>Zoom and Zoom in. Alternatively use the keyboard short cut CTRL and + Tip- enable Zoom text only. The first step is have a system. There are several systems you can use and you can even make up your own system. Having a system means that you can quickly create new passwords and that those passwords will be easy to remember and secure. See 2 Methods for creating secure and easy to remember passwords. How Do I Send Large Attachments? Email wasn’t designed for sending very large files across the Internet. However because of its ease of use it has been the main mechanism used by most people. However over the years the size of the files people want to send has increased dramatically and so alternative mechanisms have been developed that integrate with email but take the burden off the email network. These mechanisms use email to send a link to the file but use the http protocol to transfer the file outside of the email system. The most popular system is dropbox and it integrates with Yahoo mail. (Post Office Protocol version 3)- Is the Internet standard protocol for receiving email. POP3 is a receive only protocol designed to retrieve email from a mailbox on an email server and transfer it to a client machine (PC). In the default configuration the email is then deleted from the email server (This can be changed). IMAP4 was designed as a replacement for POP3. Llike POP3 it is a receive only protocol designed to access email from a mailbox on an email server and transfer it to a client machine (PC). Unlike POP3 in the default configuration the email is not deleted from the email server. This makes it the best choice protocol for mobile devices. IMAP4 also gives you access to multiple folders (not just the mailbox) and allows message preview without downloading. A more detailed discussion is contained in Email Protocols. The SMTP Protocol ( simple mail transfer protocol) is the protocol used for sending email and receiving email between email servers on the Internet. client performs a similar job to a postman. Popular desktop email clients are Outlook Express, Outlook, and Thunderbird. Email clients for mobile devices are called Apps and most Apps are specifically designed to work with a particular email service. Email that the recipient doesn’t want usually sent to many people (bulk). For a more technical definition see-http://www.spamhaus.org/definition.html. Most email providers e.g. Yahoo, Gmail provide some form of spam and virus protection as part of their email service. Usually email they consider as spam is placed in a junk email folder. Phishing is technique used by hackers to obtain details of online accounts, bank details etc. The phishing emails look genuine and try to get you to click on a link in the email and make changes to your account. The link usually goes to the hackers site which is setup to look like the target site. The term given to email access via a web browser. This type of access was made popular by hotmail (now outlook.com) and has the advantage that you don’t need to configure the client machine in order to use it. It is therefore ideal for people who access their email from a variety of machines and from varied locations. It interferes with spam checking! However most email providers like Yahoo and Gmail provide for transport level encryption using SSL which doesn’t require any end user interaction. It is important to realise that this is really only partial protection see Email encryption for more details. Most desktop email clients allow you to request a read receipt but Webmail clients don’t usually support this feature. The best way however is to request a confirmation in the email itself.